MISSOULA — Both the Ronan varsity and junior varsity boys captured the Western B Conference titles in Missoula on Thursday, defeating Eureka 37 to 64. The JV boys outscored Eureka as well, 24 to 35. Jackson Duffey crossed the line first for gold at 16:50 with teammate James Normandeau on his heels for second at 17:16. Nate Dennis followed in fourth place just 12 seconds later. 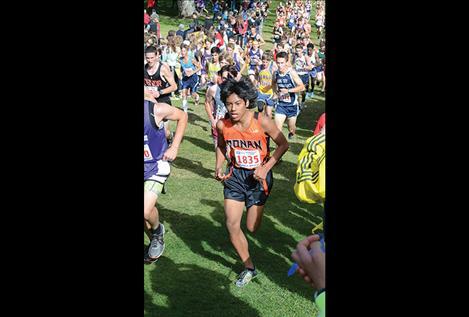 The Chiefs are looking for hardware at Saturday’s State Cross Country Meet at Rebecca Farms in Kalispell. “The varsity boys are in the hunt for a trophy, with some strong teams to contend with. Broadwater will be tough to beat this year. However, they are not completely out of reach. Other teams to contend with are Manhattan and Glasgow,” Coach Noelle Decker said. The top four places will be close, but the boys know what they are capable of “and what they need to run in order to come home with some hardware,” Decker said. With a slight advantage having run this course earlier in the season, her team knows what to expect, she said. “Things will need to fall into place for us and we will have to run with some heart; the boys understand the task ahead of them and I have confidence they can accomplish this,” Decker said. Because the Maidens had only three runners in the divisional meet, the girls did not earn a team score. Yet senior Ashley McCready came in fifth overall at 20:25. “Our girls are coming into the state meet with a different mindset than the boys,” Decker said. 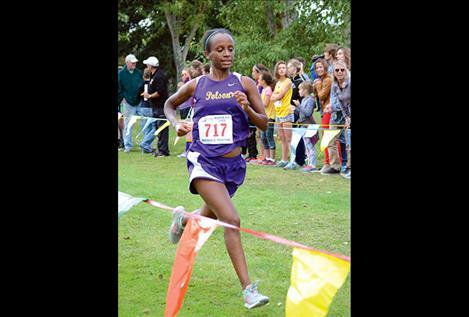 McCready will be running for a top-15 finish, which would make her All- State. Junior Penni Weyant is running to finish with a personal record and in the top 25. Rounding out the girls is newcomer and senior Julia Makovich, who is looking to improve her time and end the season with a PR, according to Decker. Each athlete knew what their role was on the team and have been supportive of each other, she added. Ronan 37, Eureka 64, Loyola 113, Libby 121, Bigfork 122, Thompson Falls 147, Deer Lodge 214 Girls Bigfork 27, Eureka 43, Libby 75, Loyola Sacred Heart 95. 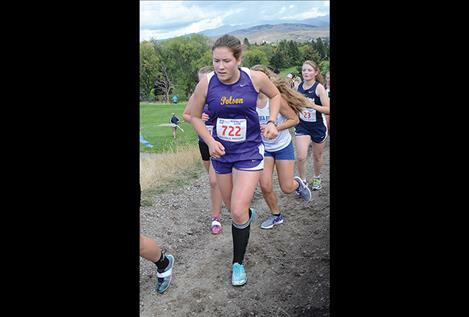 The Polson girls’ cross-country team placed fifth and the boys placed sixth at Saturday’s Western A Classic Conference Championship at Fairmont Hot Springs. 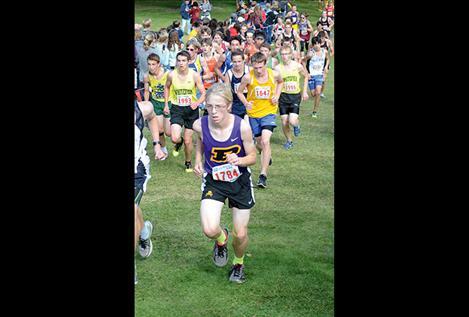 Overall 18 of the Pirate runners were able to drop their times from the late August outing on the same course. 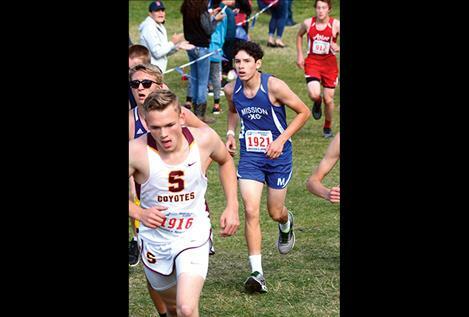 “The team had a few setbacks going into (the) conference championship meet, but they battled back with some hard running and impressive improvements on a tough Fairmont Hot Springs course,” Coach Matt Seeley said. With Bea Frissell sitting out to rest her sore knee, Molly Sitter led the way for the girls with a fifth-place All-Conference finish and 1:20 time improvement down to 20:23. Behind her, Naima Crowl crossed second for the Pirates, but just missed All-Conference recognition in 16th place. Gwen Seeley, Quinn Motichka and Malia Seeley closed out the scoring for the Polson girls varsity. Quin Stewart enabled the boys to match the girls with his solitary All-Conference performance, grabbing 10th place. Matt Sitter and Jonah DuCharme followed with solid, top-30 placings and Makauly Morrison and Kedrick Baker finished the Pirate Varsity scoring. The boys JV had three awesome breakthrough runs, according to Seeley, with senior Adan Nielsen dropping 3:14 to close out his XC season on a nice note. Freshman Keegan Brackey’s 4-minute improvement allowed him to cross fourth in the JV race (fifth best overall for Polson) and clinch a varsity spot for State. Another freshman, David Castillo, managed to improve by even more (4:39) to establish the largest season improvement on the team in his final race. The Pirates’ final race of the year will be the Class A State Championship this coming Saturday at Rebecca Farms in Kalispell with the girls race at 1:45 p.m. and the boys at 2:50 p.m.
1, Corvallis 35; 2, Frenchtown 45; 3, Columbia Falls 92; 4, Whitefish 115; 5, Hamilton 126; 6, Polson 143; 7, Dillon 163. No score: Butte Central, Stevensville. 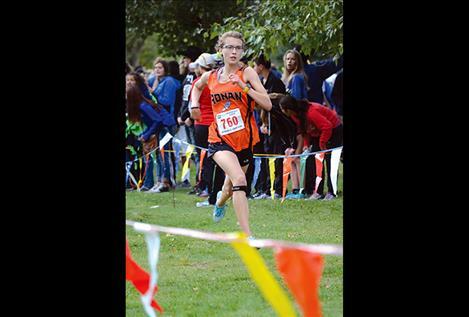 Girls 1, Whitefish 51; 2, Corvallis 65; 3, Columbia Falls 78; 4, Hamilton 96; 5, Polson 114; 6, Dillon 117; 7, Frenchtown 167; 8, Stevensville 205. No score: Butte Central. Quin Stewart 10, 17:23; Matt Sitter 25, 18:19; Jonah DuCharme 29, 18:38; Makauly Morrison 37, 19:13; Kedrick Baker 46, 19:54; Wyatt Benson 47, 20:12; Aubrey Frissell 49, 20:31. Varsity girls Molly Sitter 5, 20:23; Naima Crowl 16, 21:22; Gwen Seeley 23, 22:02; Quinn Motichka, 25, 23:27; Malia Seeley 37, 23:27; Addy Day 43, 24:28. All six St. Ignatius runners qualified for State at divisionals. Troy Matt just missed All-Conference with an 11th place finish at 17:52. Wacey McClure improved his time with a 21:15 finish. All four Lady Bulldog runners bested personal times. Karolyna Buck ended 18th with a new PR of 22:24 and Elsa Kylen had a new PR of 24:42 with her 31st place finish. Yvonne Baty (33rd, 24:46) and Shaniya Decker (35th, 26:00) both set new personal course records. Amy Dillard and Keisha Dillard will round out the girls team for the State meet next Saturday in Kalispell. “Coaching these students has been such a great experience,” Eichert said.